Monrovia Now: News and Comment about Monrovia, California: Restoration About to Begin on Old Train Station; Election Options; Huntington Median Project Starts Shortly; Cheaper Fire Insurance? Etc. Restoration About to Begin on Old Train Station; Election Options; Huntington Median Project Starts Shortly; Cheaper Fire Insurance? Etc. 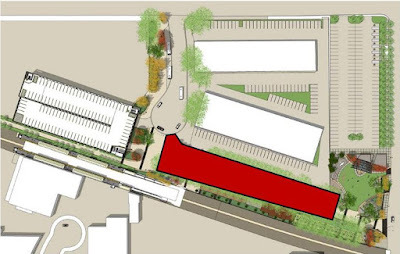 The red part of Station Square will be blocked off for renovation. ~ Here are your choices in the April 11 city election: For mayor, either incumbent Tom Adams or challenger Mark Harris. For city council you get to choose two of the following: challenger Clifford DeCosta, incumbent Larry J. Spicer, incumbent Alexander C. Blackburn. ~ Restoration begins next week on the Historic Santa Fe Depot. It should be done by this June or July. 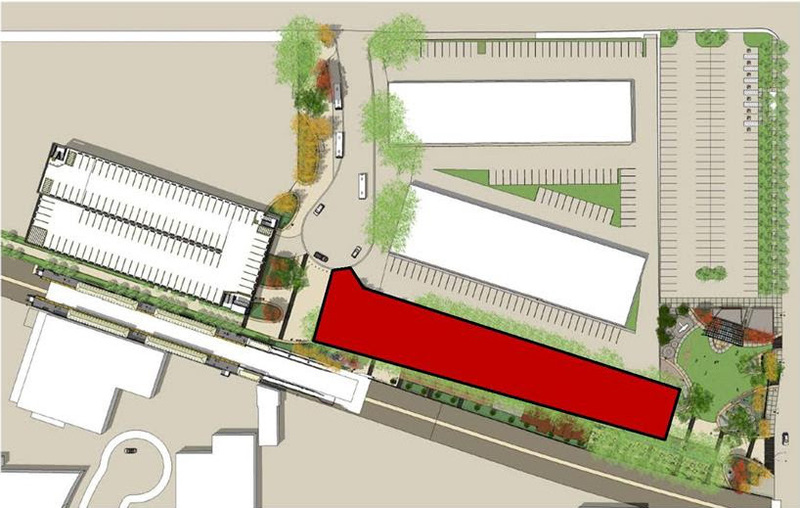 Public access to the Station Square Promenade will be restricted for the duration of the construction. The area in red in the image will be blocked off. ~ The Huntington Drive median improvement project begins on Jan. 23 and should be done by late March, making the median more drought tolerant. It involves switching to automated drip irrigation, removing 27 dead or diseased trees and replacing them with 60 new ones, and planting more than 7,500 plants. ~ The fire department is being assessed on Jan. 24 by the Insurance Services Office. If it can bring its ISO rating up from class 3 to class 2 or 11, Monrovia property owners could see a 6-8% decrease in fire insurance premiums. ~ Chon Cervantes, the city's Building Official, will retire after 30 years. His last day will be Thursday, Feb. 2. His going away breakfast party, called "Stop Work Notice" will be held Feb. 2 at 9 a.m. in the city's Emergency Operations Center in the Police building. You are welcome to come. Replacing Cervantes will be Evan Knuckles, current Senior Combination Inspector. ~ City sewers are being cleaned and inspected using a Closed Circuit TV system, starting on Jan. 17 in northwest Monrovia. It'll take a bit over six months to do the whole city.